Some knowledge of animal cell structure is usually required for introductory courses in Human Anatomy and Physiology e.g. ITEC Diploma in Anatomy & Physiology, Human Biology e.g. A-Level, and other first-level courses in health sciences and related subjects. This page includes the basic structure of a general human cell (i.e. an animal cell rather than a plant cell) and some of the organelles within it. Histology is the microscopic study of the structure of biological tissues using special staining techniques combined with light and electron microscopy. The detail of even the general cell structure summarised below cannot be observed without the use of these modern techniques. The structure of cells varies according to the type and purpose of the cell (for example, which functions it is performing and in which part of the body). All plant and animal cells contain organelles which are structures within the cell that are specialised for particular functions. Are there any cells that do not contain organelles ? Yes: Prokaryotic cells, e.g. bacteria cells, do not contain "true" membrane-bound organelles - not even a nucleus. Conversely, plant cells and animal cells are examples of eukaryotic cells which contain various types and quantities of membrane-bound organelles, depending on the specific type of cell and its functions within the organism of which it is a part. The cell membrane keeps the cell together by containing the organelles within it. Cell membranes are selectively-permeable, allowing materials to move both into and outside of the cell. The centrosomes contain the centrioles, which are responsible for cell-division. Cytoplasm is a jelly-like substance that is sometimes described as "the cell-matrix". It holds the organelles in place within the cell. The golgi apparatus of a cell is usually connected to an endoplasmic reticulum (ER) because it stores and then transports the proteins produced in the ER. Lysosomes are tiny sacs filled with enzymes that enable the cell to utilize its nutrients. Lysosomes also destroy the cell after it has died, though there are some circumstances (diseases/conditions) in which lysosomes begin to 'break-down' living cells. "Microvilli" is the pural form; "Microvillus" is the singular form. Microvilli are finger-like projections on the outer-surface of the cell. Not all cells have microvilli. Their function is to increase the surface area of the cell, which is the area through which diffusion of materials both into, and out of, the cell is possible. "Mitochondria" is a plural term; which is appropriate as these are not found alone. The quantity of mitochondria within cells varies with the type of cell. These are the energy producers within the cell. They generate energy in the form of Adenosine Tri-Phosphate (ATP). Generally, the more energy a cell needs, the more mitochondria it contains. The nuclear membrane separates the nucleus and the nucleolus from the rest of the contents of the cell. Nuclear pores permit substances (such as nutrients, waste, and cellular information) to pass both into, and out of, the nucleus. The nucleolus is responsible for the cell organelles (e.g. lysosomes, ribosomes, etc.). The nucleus is the "Control Center" of the cell, which contains DNA (genetic information) in the form of genes, and also information for the formation of proteins. Information is carried on chromosomes, which are a form of DNA. Ribosomes interpret cellular information from the nucleus and so synthesize appropriate proteins, as required. 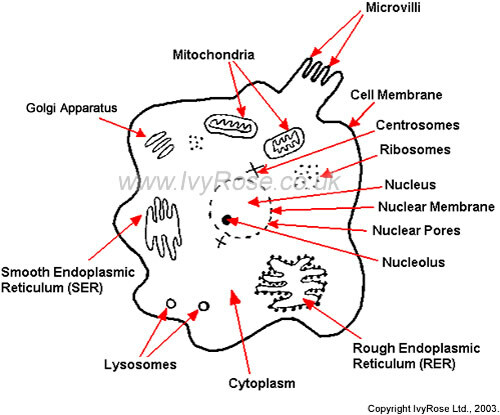 'Rough' indicates that there are ribosomes attached to the surfaces of the endoplasmic reticulum. The endoplasmic reticulum is where proteins and lipids are produced within the cell, and is also concerned with the transport of these materials within the cell. 'Smooth' indicates that there are no ribosomes attached to the surfaces of the endoplasmic reticulum.The endoplasmic reticulum is where proteins and lipids are produced within the cell, and is also concerned with the transport of these materials within the cell. Other components of a typical cell not shown on the above simple diagram include: cilia (sing. cilium), cytosol - a component of cytoplasma, glycogen granules, intermediate filaments, microtubules, microfilaments, pericentriolar areas (around the centrioles), peroxisomes and secretory vesicles. A simple representation of the structure of animal cell membranes is shown below. This is illustrates a cross-section of the phospholipid bilayer that forms the membrane around the outside of all animal (including human) cells. This plasma membrane consists mainly of phospholipids and proteins, most of the membrane proteins being glycoproteins. The two components of the phospholipids are the heads (represented by black circles), and the fatty acid tails (that extend into the phospholipid bilayer). Other molecules present in the plasma membrane generally include cholesterol (as illustrated) and glycolipids. Note that this membrane is non-rigid; if the cell had a cell-wall then it would be rigid ... and a plant cell. Integral Proteins extend through the bilipid layer and among the fatty acid tails of the phospholipids - though not necessarily all the way through the plasma membrane. Peripheral Proteins are loosely attached to (either the interior or exterior) surface of the plasma membrane. See also functions of cells, functions of the cell membrane and compare plant, animal and bacteria cells.